• 69% of occupants have the ability to adjust ventilation and temperature controls to meet their individual needs. • 38% reduction in installed interior lighting power density (watts/square feet) below the code standard. • 64% of the existing interior elements (walls, flooring, ceilings) have been reused. The Earth and Planetary Sciences (EPS) Museum Project was the renovation of approximately 3,500 square feet on the second floor of the Geological Museum to create faculty offices and support space for three professors within the Department. 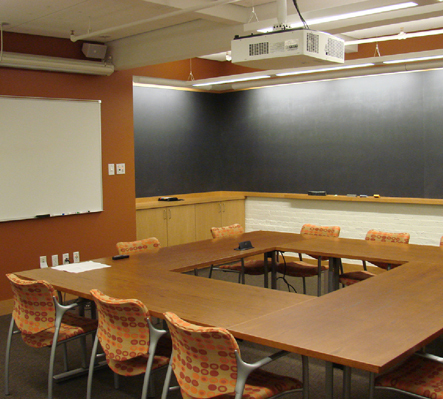 In addition to the three private offices, the renovation included offices for Post Docs, Graduate Students and a receptionist, workrooms, a seminar room, and a kitchenette. The Geological Museum is located within the 175,710 square foot Harvard University Museum at 24 Oxford Street in Cambridge, Massachusetts. The renovated space will provide faculty and students with upgraded interior finishes, furniture and lighting for work and study environments. Work areas are located along the building’s perimeter, thereby capitalizing on the large existing exterior windows that not only bring daylight into the spaces and reduce ambient lighting demands, but also create a comfortable work environment by allowing for views of the outdoors.